HAL/S is a high-level programming language commissioned by NASA in the late 1960s to meet the real-time programming needs of the Agency. At the time, programs used on board spacecraft were either written in assembly languages or in interpreted languages. The former make programs difficult to write and maintain, and the latter are insufficiently robust and slow. Also, future systems were expected to be much larger and more complex, and cost would be moderated by the use of a high-level language. In addition to new statements, HAL provided for new types of program blocks. Two of these specific to real-time processing are COMPOOL and TASK. "Compools" are declarations of data to be kept in a common data area, thus making the data accessible to more than one process at a time. It was expected that several processes would be active at once and that many data items would need to he dynamically shared. Task blocks are programs nested within larger programs that execute as real-time processes dependent on one of the most powerful HAL statements, SCHEDULE. Scheduling the execution of specific tasks was simplified by the syntax of HAL. Fig. 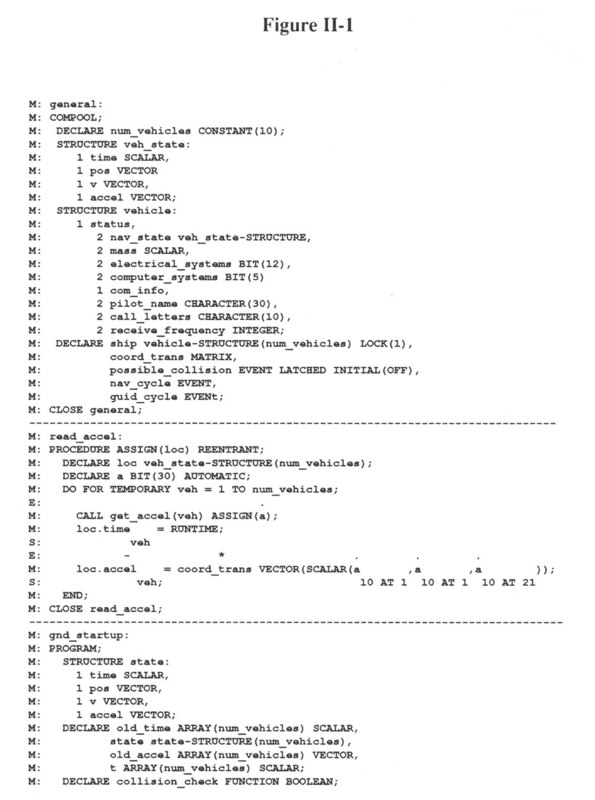 II-2 shows the final page of the procedure STARTUP, written for use on the Galileo spacecraft attitude control computers, containing the master scheduling for the entire program. Note that the components of the SCHEDULE statement are the task name, start time, priority, and frequency. The statement "SCHEDULE ERROR0 ON RUPT0 PRIORITY(22);" tells the operating system to execute the task ERROR0 when an interrupt named RUPT0 occurs with a relative priority of 22. 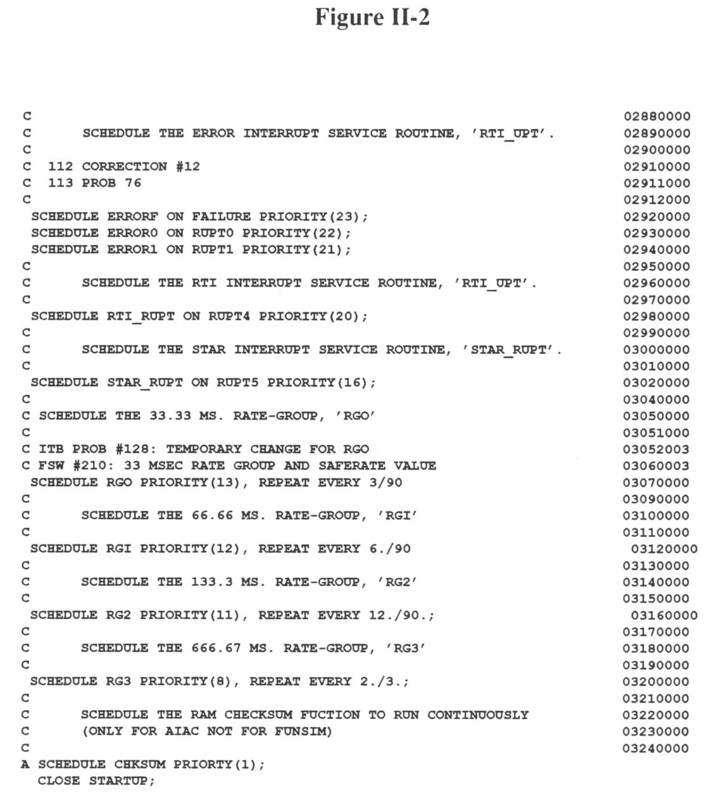 A different form of the SCHEDULE statement is "SCHEDULE RGl PRIORITY(12), REPEAT EVERY 6.190," which initiates the task handling the highest frequency rate group and repeats it 15 times per second. The statement TERMINATE cancels a specified task upon a designated interrupt or time. HAL did not have the widespread use NASA had hoped for when the language was designed. Although the Shuttle on-board programs are exclusively in HAL, the Galileo attitude control system is the only other flight project to make significant use of the language. Other projects, though instructed to use HAL, found reasons to avoid it, although the Deep Space Network applied it to some ground software. In late 1985, NASA announced that the language of choice for the upcoming Space Station project would be Ada. Commissioned by the Department of Defense in the late 1970s to serve as a standard for all contractor software development, Ada includes real-time constructs pioneered by HAL such as task blocks, scheduling, and common data. The announcement made NASA the first nonmilitary agency to use Ada. Ada was adopted because commercial compilers were available and because the DoD's insistence on its use meant that it would be around for a long time. It appears that HAL will be phased out, destined to join the hundreds of other dead computer languages. 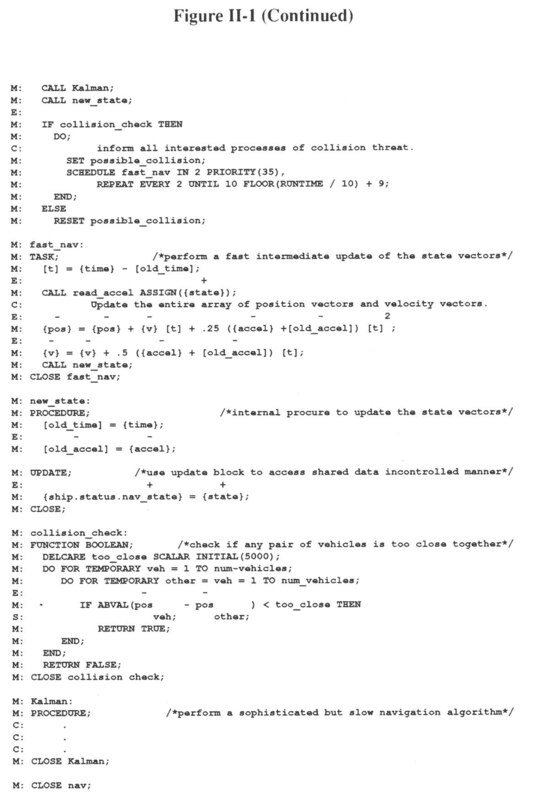 - Intermetrics, Inc., HAL/S-360 Compiler System Specification, Version IR-60-7, February 23,1981. - Intermetrics, Inc, HAL/S Language Specification, Version IR-542, September 1980. - Intermetrics, Inc., HAL/S Programmer's Guide, Version IR-63-5, December 1981. - Ryer, Michael J., Programming in HAL/SIntermetrics, Inc., Cambridge, MA, 1978.